Download Station functions as a 24×7 BitTorrentTM, FTP, HTTP, eMule, and NZB download center without a PC. The eMule download engine allows search-n-download capability with a web-browser without installing additional desktop applications. SKU: DS212J-8TB63 Category: Entry Level 2 Bay NAS Servers. Tags: 7200, desktop, hdd. USBCopy allows you to quickly back up your data from an USB storage device such as an USB flash or USB card reader to your DiskStation with just one single touch on the front-panel copy button. Photo Station simplifies photo, video, and blog sharing over the Internet. The flexibility of photo theme customization, blog layout arrangement, visitor’s privilege setting, RSS feed, and the dazzling 3- dimentional photo browsing with Cooliris make Photo Station your state-of-the-art lifestyle sharing center on the Internet. The iPhone and Android App, DS audio, allows you to stream music stored on your DiskStation with your mobile devices where Internet access is available, while DS photo+ allows browsing and uploading photos and videos stored on DiskStation from your mobile devices. If you own a mobile device running on Windows Mobile® 6.0, iPhone OS 2.2.1 onward, or Symbian OS 9.1, you can log on your DiskStation to view photos with Mobile Photo Station and read supported file formats with Mobile File Station wherever Internet access is available. 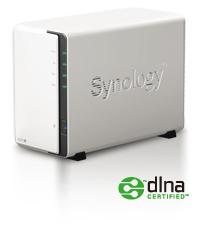 Synology DiskStation is designed and developed perpetually with the concept of energy saving. Compared with its average PC counterparts, Synology DiskStation consumes a relatively low amount of power and hibernates when not in use. This not only helps to save energy but also extends the lifespan of the hard disk. Synology DiskStation truly earns the title of “green product” because of the unique Scheduled Power On/Off feature, and the smart fan design effectively cools down the system with minimum power consumption, yet keeps the system quiet on operation. Finally, all Synology products are produced with RoHS compliant parts and packed with recyclable packing materials. Synology recognizes its responsibility as a global citizen and is continually working to reduce the environmental impact of the products we create.